During this talk, Mitch will discuss creating a winning cloud strategy for your business and the three stages for a successful transition. Since cloud strategy is still new to a lot of companies, Mitch with cover the importance of cloud strategy and how to execute it. Creating a cloud strategy also acts as a tool for communicating your vision to the people you work with. This talk will aim to simplify this communication by breaking it down into three steps. Mitch will shed light and offer a prescriptive, easy way to create your own cloud strategy. You should be able to come away from the talk with how to implement this for your own organization. Mitch Greenwald is an active participant in the “growing up” of technology, and has a diverse background from writing millions of lines of code, to managing and sponsoring multi-million dollar projects. Mitch has been involved with programming mini-computers, PC applications (while they were still in their infancy), to client/server systems, then to web-based environments including infrastructure and security, and today to the cloud. His balanced perspective includes product development, strategic operations, consulting, as well as executive leadership. Mitch has spoken at many industry events and has won industry awards for numerous products and projects completed by his teams. He is passionate about applying technology to increase the value of a business. 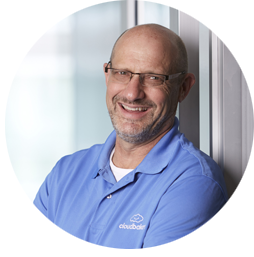 Having been a CIO and executive leader, Mitch understands the corporate side of issues and can easily relate to all of the clients he works with as Founder and CEO of Cloudbakers. Cloudbakers is a Chicago-based cloud solution provider. We utilize cloud-based software as a service (SaaS) products to provide cloud solutions for small/medium businesses as well as Enterprises. We bring the human element to technology and use our repeatable process to help clients migrate off their legacy systems to secure, reliable and cost-effective solutions. We turn projects into partnerships and users into evangelists.